Cooking octopus can be tricky. But when done right, it’s tender, delicious and loaded with health benefits (low-calorie, lean, vitamin-rich). Japanese and Mediterranean diets are swimming, as it were, with octopus options — as is this town, where many restaurants have the dish on their menus. According to a sampling of chefs, the Spanish and Portuguese seafood are generally favored, and most cooks have a specific size they prefer — from one to seven pounds — for reasons ranging from tenderness to plate presentation. Some eateries serve octopus up with spices from Peru, while others experiment with the flavors of North Africa. 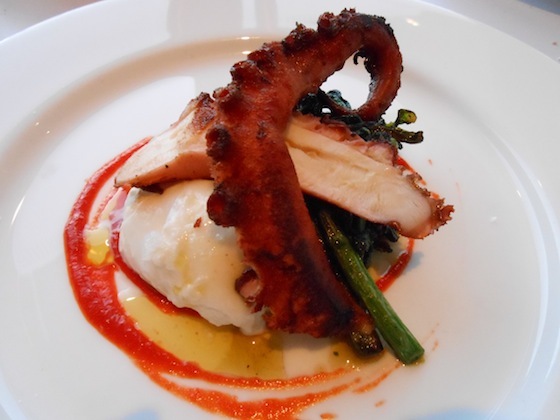 Turn the page for 10 of our favorite octopus dishes around town. I may have to give some of these a try…it’s not something I order when I go into a restaurant but I’m trying to be open-minded!